A fisheye scene shows 180 degrees of the sky above Peak District in the United Kingdom during a winter, moonlit night, with a subtle presence of the Milky Way twinkling among high trees. Miguel Claro is a professional photographer, author and science communicator based in Lisbon, Portugal, who creates spectacular images of the night sky. As a European Southern Observatory photo ambassador, a member of The World At Night and the official astrophotographer of the Dark Sky Alqueva Reserve, he specializes in astronomical sky-scapes that connect Earth and the night sky. Join Miguel here as he takes us through his photograph "A Full-Dome View from Peak District." 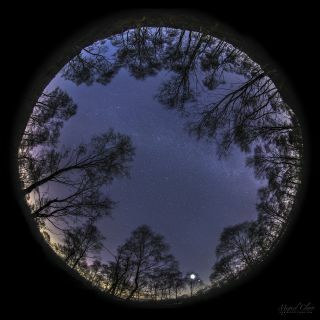 A full-dome fisheye view shows 180 degrees of the night sky over the United Kingdom's Peak District on a crystal-clear winter night, when thermometers dropped to minus 8 degrees Celsius (18 degrees Fahrenheit). To capture the image, I used a Canon EOS 6D DSLR camera set to capture a 30-second exposure with the ISO set to 2000 and with an 8-millimeter “all sky” fish-eye lens, set to f/4.